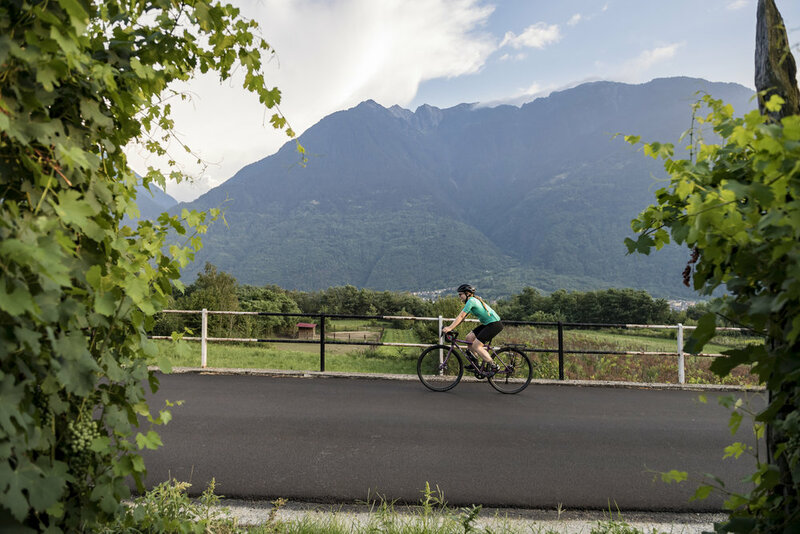 Sondrio | Road 50 km | The definitive Valtellina road ride – vineyards, orchards, tiny roads. In winter it’s hard to know which roads are still passable by bike – is that stretch of tarmac getting any sunshine at all? A safe bet is to keep high on the south-facing slopes. That’s exactly what this sublime route does. A breath-taking excursion into Valtellina’s wine territory. We think it is unrivalled! You’ll head eastwards up the valley along the main road for a short stretch – it’s very quiet though. After a few minutes of pedalling you’ll find yourself on back roads that careen along the bottom of the valley, taking you on a whistle-stop tour of the orchards to Chiuro. Once you reach Chiuro, there’s the beautiful Castionetto climb that takes you up to the Panoramica. That road, the Via Panoramica, is something else entirely. Unbeatable views, fairly quiet on the traffic front, it’s a real pleasure to cruise along. This route doesn’t follow it for long though; you’ll be spewed out onto back roads that bypass the bigger villages and go all-in for authenticity. Expect little archways, ancient buildings and a whole lot of character through the vineyards. This route starts and finishes at Sondrio train station, which even in the winter should get a fair amount of sun.